If you were lucky enough to live in the Land of the Rising Sun or even just visit, you know just why Japanese cuisine is world-famous. Sadly, not everyone is able to spend the time or money to experience it for themselves. 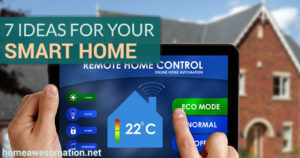 Fortunately for those who haven’t had the opportunity, you can bring authentic Japanese creations to your very own kitchen thanks to the variety of Japanese kitchen gadgets available to foodies worldwide. Whether you’re Japanese & feeling homesick or just want to see what all the fuss with Japanese cooking is about, consider adding these Japanese kitchen gadgets to your counter top or pantry for a little taste of Japan. Everyone loves sushi rolls, but not everyone loves what takeout sushi can cost! If you’re looking to enjoy some of your favorite rolls but don’t want to pay the premium a sushi restaurant will charge you, a sushi roll machine can help. With the moxie&co Sushi Roll Making Kit, you’ll get everything you need to make your own sushi rolls at home. 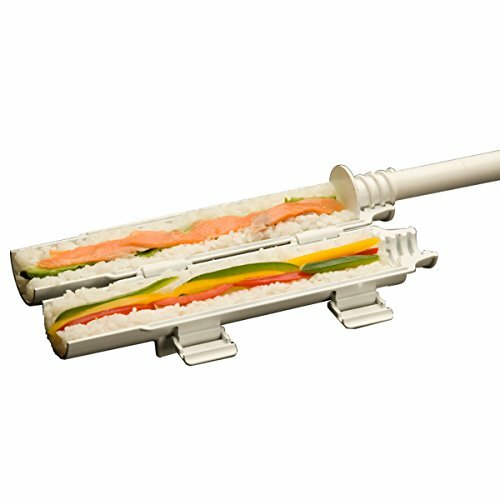 Simply pick up your favorite fish from the market, steam some rice, and add them along with your favorite vegetables to the “Sushi Bazooka”. Once you’ve assembled your ingredients, simply close the container, set down some seaweed wrap, and push your perfectly formed sushi roll out to the seaweed base. Roll it up, cut some pieces, and you’ve got your very own sushi rolls. No matter where you go in the world, there are going to be local snacks that you simply have to try. One of these Japanese snacks is taiyaki (“baked red snapper”), a mix between a cake and waffle in the shape of a fish. 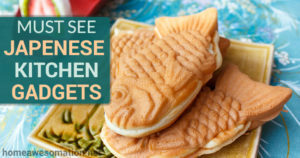 Taiyaki are traditionally stuffed with anko, a red bean paste, but when you’re making your own they can be filled with just about anything you want. Some popular fillings are custard, cheese, sweet potato, and chocolate. Given the similarities between taiyaki and waffles, it makes sense that they’re cooked similarly as well! Taiyaki are commonly cooked with a waffle iron-like gadget called a taiyaki press. 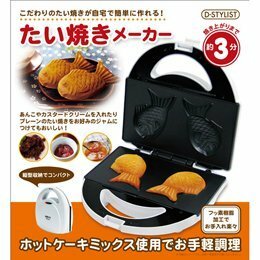 The D-STYLIST Taiyaki Maker contains fish-shaped molds that you pour batter into before adding your chosen fillings. Once your creation is assembled simply close the press for a few minutes and wait until you have perfectly browned taiyaki ready to “swim” into your mouth. If you’ve ever tried to make any food that requires pinched/pleated edges to keep filling inside, you probably wore your fingers out (and frustrated yourself!). Consisting of a dough wrapper filled with meat and vegetables, gyoza are one of these pesky little creations – but they don’t have to be. 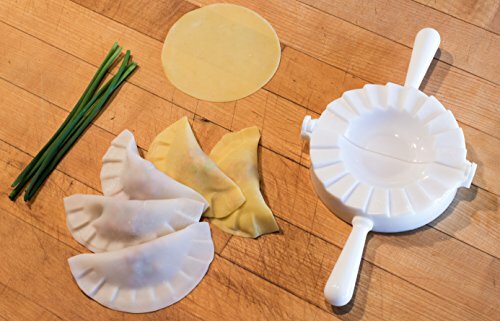 With a tool like Helen Chen’s Asian Kitchen Gyoza Press, you can take the frustration out of making gyoza and cut the time they take in more than half. All you have to do is place a wrapper inside, fill the middle with your ingredients, and press the handles down. It’ll pleat the edges, seal the ingredients inside, and make a cooking-ready gyoza in just a few seconds. Interested in taiyaki but looking for something fishier? Takoyaki (“baked octopus”) is a Japanese snack food that you’ll find at many street vendors in Japan. Traditionally, takoyaki are batter-based balls stuffed with octopus, pickled ginger, and green onion & served with a Worcestershire sauce on top. Fortunately, you don’t need to go to Japan to give takoyaki a try. 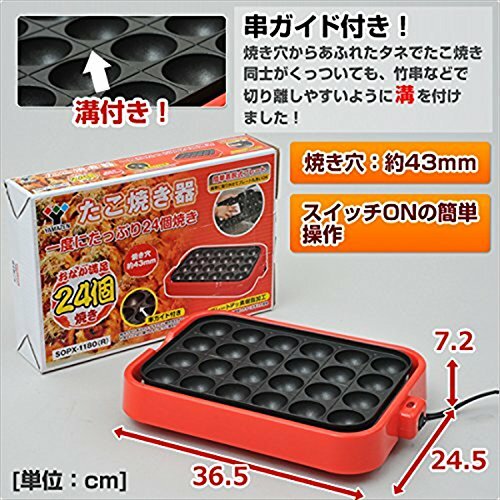 The YAMAZEN Electric Takoyaki Pan makes it easy to cook your own takoyaki at home. 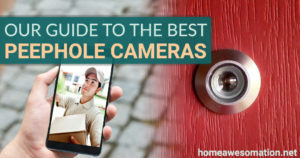 With a non-stick plate that holds up to 24 balls at once, you can make enough for a small family at a time. Just whip up your batter, chop your vegetables & octopus, add the ingredients, and flip them every few minutes until they’re golden brown. Serve with sauce and enjoy! People all over the world like beer, but Japan puts a bit of a twist on the old classic – they freeze it! 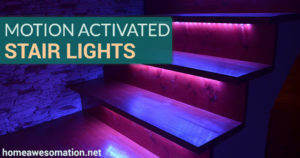 Are you sick of your beers getting warm while you sit out in the summer catching some rays? Do you want the coldest beer you can find? The Japanese company Kirin has figured out how to give you just that. 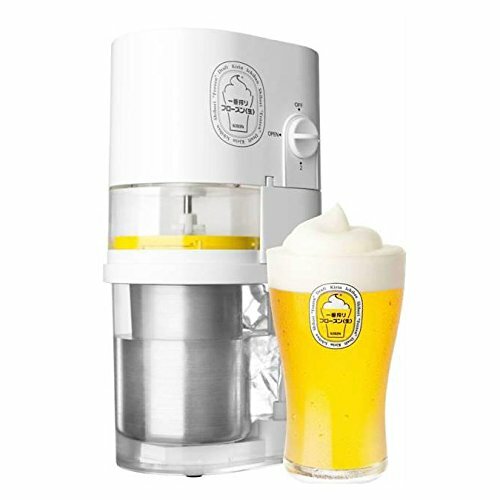 With the Kirin Frozen Beer Slushy Maker, you can freeze your favorite beer to create an ice-cold frothy foam that looks cool, tastes good, and keeps your drink cold when placed on top of your glass. Simply add your ale or lager of choice, some ice, and a pinch of salt to the machine. After an hour you’ll have a soft-service ice cream-like dispenser giving you frosty froth for your brew. Japan is a country of innovation, efficiency, and convenience. The Japanese kitchen gadgets that we’ve listed are all 3 of those things, allowing you to experience some Japanese classics in your own kitchen without needing to hop on a plane. Add one – or them all – to your countertop today to add a little bit of culture to your kitchen!